In the past few years, a movement for “deeper learning” has emerged on the United States’ educational scene, based on decades of development work by educators, support from the philanthropic community, and the interest and engagement of national and local policymakers. This is the first in a series of research reports on the strategies, opportunities, and outcomes of a set of high schools explicitly organized to promote deeper learning among their students. 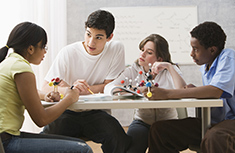 Failure of the No Child Left Behind Act (2001) to produce the levels of proficiency and college preparedness anticipated by its authors has sparked considerable discussion and debate in the past six years about what today’s students really need to know and be able to do to be successful both in school and in their lives and work after graduation. Much of the policy focus has been on the need for students to develop deeper content knowledge and an ability to apply their knowledge and skills to novel tasks and situations inside and outside of school. In this report, the authors focus on the assumption that educators can design/redesign schools’ instructional strategies, structures, and cultures to explicitly focus on deeper learning. The goal is primarily descriptive—to provide a picture of the strategies and structures the adults in the sampled network schools used to foster deeper learning. Network schools took a range of approaches to developing the deeper learning competencies. Most schools integrated project-based learning to develop mastery of core academic content knowledge and critical thinking skills. However, projects looked different in different schools, ranging from semester-long projects with multiple components and assessments to short-term projects addressing specific units. Interpersonal skill development was a goal at a majority of network schools and was addressed through instruction, assessment, and internship opportunities. Network schools used a variety of structures and strategies to encourage the development of academic mindsets and learning-to-learn skills. Relevant strategies included internships, projects, study groups, and student participation in decision-making. Most network schools had established structures and cultures to support the implementation of instructional strategies aligned with deeper learning. The Shape of Deeper Learning: Strategies, Structures, and Cultures in Deeper Learning Network High Schools by Mette Huberman is licensed under a Creative Commons Attribution-NonCommercial-NoDerivatives 4.0 International License.